AURORA, OH: Network Technologies Inc (NTI) announces the addition of the SPLITMUX® DVI/VGA Advanced Quad Screen Splitter with Built-in KVM Switch and Real-Time Video to its popular line of video products. The unit enables four computers to display video simultaneously on one monitor and can switch one of the four attached computers to a shared keyboard and mouse for operation and to four additional USB devices. The SPLITMUX-DVI-4RT accepts analog and digital signals at the same time, supports video resolutions to 1900x1200, and is HDCP compliant. The available display modes include: Quad, Picture in Picture (PiP), Full Screen, Dual, Fade Through Black, and Win modes. Audio can be independently switched from HDMI sources connected to the DVI-I port using a DVI-D to HDMI cable. The unit features fluid, real-time video performance with 60 frames per second in all four quadrants when in Quad mode. The screen display can be rotated at different angles from 0°, 90°, 180°, and 270°. The Advanced Quad Screen Splitter comes with a built-in 4-port USB 2.0 hub and supports USB touch screen monitors. All connected USB devices can be switched between connected computers. BNC/RCA composite video devices, such as a security camera, can be connected to the unit using the optional BNCSV-VGA-CNVTR BNC to VGA converter. Control the splitter through the front panel interface, keyboard/mouse commands, on screen display (OSD), or RS232. It supports KVM over IP Extenders to control the Quad Screen Splitter remotely in quad mode or PiP mode. The SPLITMUX-DVI-4RT can be cascaded to display video from up to 16 video sources on one screen. 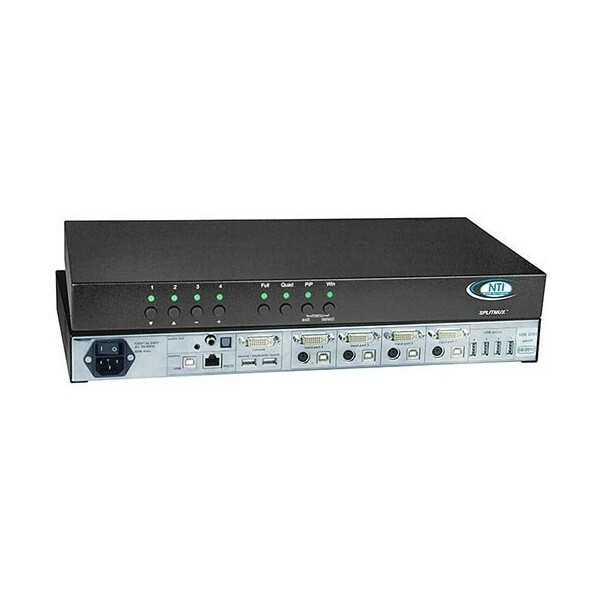 A master/slave setup is used for this configuration—a master splitter connects to four slave splitters, with each slave splitter connecting to four DVI video sources. Each connected unit needs to be in Quad mode in order to display 16 video sources on a single monitor. The display modes of slaves and masters can be individually set, combined, and switched when cascading multiple units, enabling a wide variety of configurations. Available for immediate sale, the SPLITMUX-DVI-4RT costs $4,015.